Update: We’re sad to say that we didn’t get enough campers to offer this event, but we’re regrouping and planning our next steps. Stay tuned for some pop-up family events pulled from the summer camp’s curriculum. Original story: How can you engage your child with history while strengthening their literacy skills and letting them have a ball? 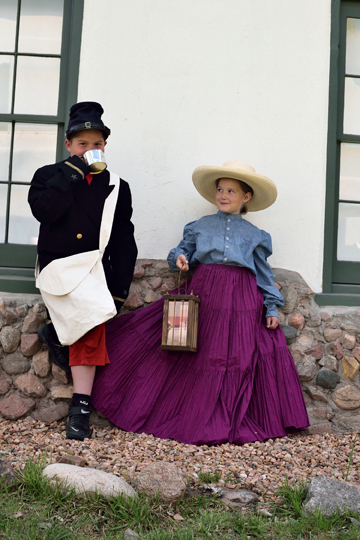 Give them the gift of a weeklong trip to action-packed 1863 at the New Mexico History Museum’s summer camp, Time Trekkers. Children 9-11 will enjoy VIP access to the museum and get daily doses of hands-on learning—braiding horsehair bracelets, gathering a picnic lunch at the Santa Fe Farmers Market, practicing calligraphy, roping a calf dummy, hand-stitching their own book, playing old-time games and more. Make new friends, strengthen literacy skills, explore different kinds of artwork and learn how history connects the past to the present. Time Trekkers takes place 10 am–4 pm, Monday–Friday, June 15–19. Cost is $125 (10 percent discount to children and grandchildren of Museum of New Mexico Foundation members). Space is limited. For info on how to register by June 1, contact René Harris at rene.harris@state.nm.us or Melanie LaBorwit at melanie.laborwit@state.nm.us. Try on clothes from the 1860s and master the craft of horsehair braiding. Take a field trip to the Santa Fe Farmers Market to gather fresh fruits and vegetables and help prepare old-style recipes. Go behind-the-scenes at the museum’s Fray Angélico Chávez History Library and Photo Archives to check out fascinating maps. Practice the art of writing with a quill. Learn how to make a rope, then rope a cow. Be part of a bucket-brigade contest. Make adobe bricks. Step inside the Palace Press to learn a simple bookbinding technique. Play! Participate in historic games such as hoops, marbles, three-legged races and the game of graces. Art projects are woven into daily activities, and all supplies are included in camp fee. A short playground/snack break is scheduled each day. When Museum Hill properties banded together to create the “Summer of Color,” they asked downtown museums and galleries to mount their own color-based shows. But our galleries were already filled with exhibits (colorful ones, no less), so we were initially stumped. Then the National Trust for Historic Preservation declared the Palace of the Governors a National Treasure, and a brainstorm erupted. Why not capitalize on the attention being given to the Palace’s maintenance needs by hosting programs about the building and other adobe structures? Thus was born “Adobe Summer,” a series of free events dedicated that most basic of building materials, mud. The Palace of the Governors, ca. 1915, by Jesse Nusbaum. 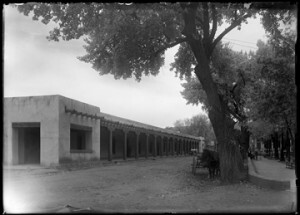 Palace of the Governors Photo Archives 013045. If all goes well, contractors will begin replastering the Palace Courtyard this summer, giving everyone an intimate glimpse into how adobe works. Beyond new plaster and, likely, a few new adobe bricks, the building needs new hardwood floors, a new roof, improved electrical systems, and some type of fire-suppression equipment that won’t imperil the adobe walls. After the structural work is done, we aim to re-do the exhibits to more fully tell the story of the building itself. Sunday, May 31, 2–3 pm: “Restoring the 1785 Roque Lobato House in Santa Fe.” A panel discussion and book signing with author Chris Wilson, architect Beverly Spears, and Alan “Mac” Watson, vice chairman of the Historic Santa Fe Foundation, on the successful renovation of this historic home. Sunday, June 28, 1:30–3:30 pm: Make sand casts of your hands for a family keepsake. Saturday, July 25, 1–3 pm:“Earthen Architecture—Past, Present and Future.” Get a multicultural perspective of how communities preserve adobe structures, featuring Jake Barrow, program director for Cornerstones Community Partnerships; Tomacita Duran, executive director of the Ohkay Owingeh Housing Authority; and artist Nicasio Romero of the Villanueva Valley. Friday, Aug. 7, 6 pm: “Wars, Revolts, and Defining Collective Memory in the Context of the Great Pueblo Revolt,” a talk by archaeologist and author Jason Shapiro. Friday, Aug. 28, 6 pm: “El Presidio de Santa Barbara: Its Founding, Heyday, Decline, and Rebirth.” Jarrell Jackman, executive director of the Santa Barbara Trust for Historic Preservation, speaks on the renovation of that city’s 1782 Spanish presidio. Any day, everyday: Wander the Palace and try to hear the whispers of its past, from its massive walls to its thick vigas to the floor hatches revealing its earliest foundations. Pilar Cannizzaro, preservation planning manager for the state Historic Preservation Division, said she fell in love with the building the first time she walked through in 1984.